My beginning with stamping started approximately 13 years ago when a friend with whom I was working at the time invited me to a Close To My Heart monthly group. Little did I realize how addictive this hobby is and how many different directions it can go. We met at the same lady’s home once a month; watched a demonstration from the CTMH rep and made four very basic cards. I still have some of the very first stamps and still usable stamp pads I purchased from those early meetings. From there my love of stamping/ cardmaking has blossomed! I try to include some kind of collage aspect into almost every card and/or ATC I create. I have really been trying lately to not do collage every time but, instead, expand my end results into other formats. I am ever thankful to fellow stampers, magazine articles, group swaps, online bloggers, and local card classes for my learning and trying new techniques. There can be no favorite! 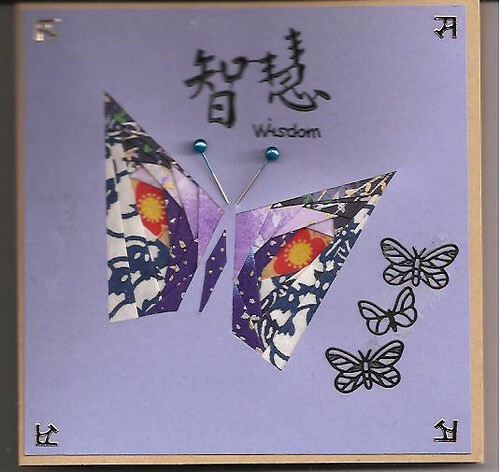 First, regardless of company name, I look for stamps that I do not have and that are calling “buy me.” I am partial to clear acrylic stamps; however, if I find a stamp I really like or NEED, it makes no difference how it has been made – mounted, unmounted, acrylic, etc. Also I have almost every one of Stampin’ Up’s oriental-themed stamps, even though SU provides only a very limited supply. When I go to classes or when I am home, I try to always use a mousepad under whatever I am stamping. Having scrap paper available to try the stamp to see if there are any irregularities is also a must-have. 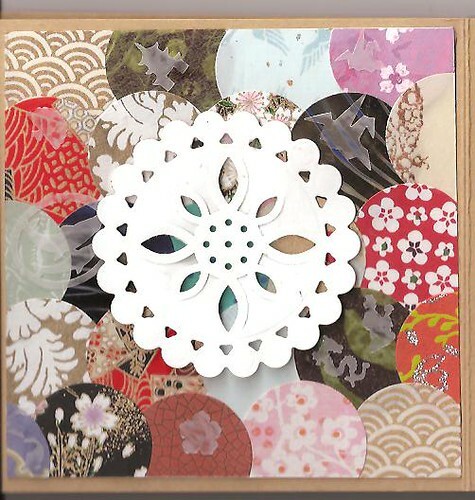 Again, I have no one favorite – beads, ribbon, charms, diecuts – whatever continues the theme of the card. Sometimes even another stamped image provides the best embellishment. Always look at what other members stamp, what color combinations they use, what suggestions are made by others – everything is helpful in creating one’s own style. Whenever I look at blogs and other people’s creations, I always think of how their examples can be used in making my own cards. Whenever I find a layout I particularly like, I save it in an online folder for future reference or print out a copy for immediate use. 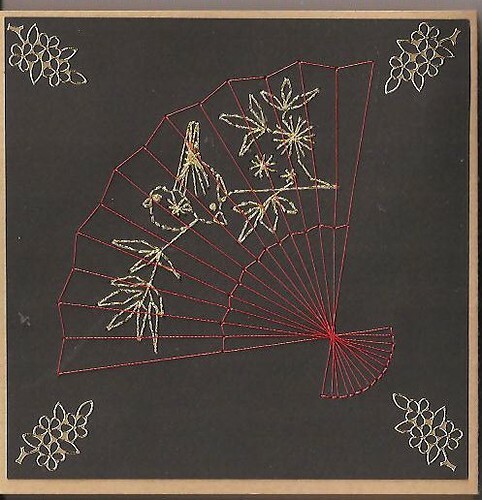 Getting freebie samples of oriental images, for example from Dover’s weekly newsletter, is a great source of oriental graphics. As a little girl, I lived in the upstairs apartment of my grandparents. Being the only grandchild at the time, I’m sure I was quite spoiled. 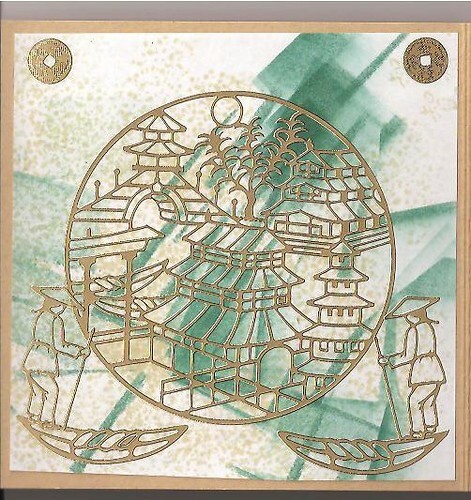 My grandmother had a trivet that I could turn upside down on paper to trace the oriental pattern to my heart’s content. Here, I believe, was the beginning of my love of oriental. I love the soft colors and delicate patterns and themes that are present in anything oriental; it is all a soft, relaxing influence. I would love to go back to Okinawa and Japan to look for stamps. When I lived in Okinawa, I was not stamping at that time of my life; so I did not have this interest. I would love to go to Japan to visit a friend and see this artwork through her influence in her home surroundings. I also would love to visit the Netherlands. 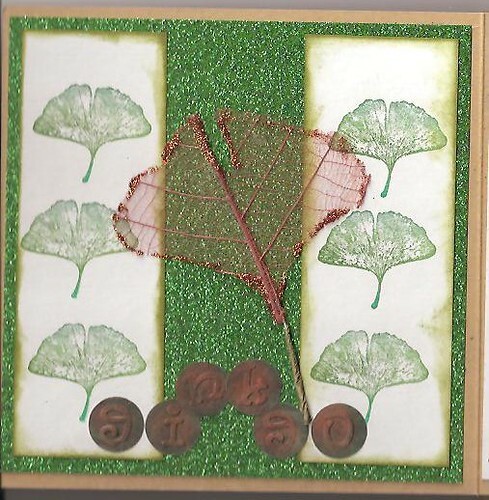 I belong to several other online groups in which I am active: Embossing Exchange, Midwest Stampers, Love Art Friends International, Technique Junkies, Michael Strong. My local shop, Scraps of Art, has an excellent ATC group that meets and swaps monthly. I also go to a shop in Spring Hill, Florida, once a month for card-making classes. 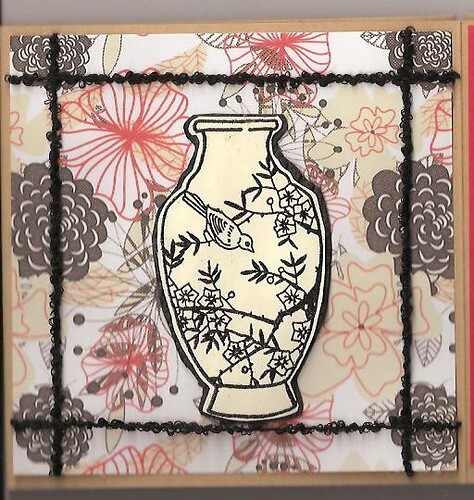 I attend two local Stampin’ Up classes on a monthly basis. One other local group meets twice a month. We have a planning session every six months to choose themes for each of the upcoming meetings; there is a potluck dinner at these planning sessions; and we have a $10 Christmas exchange. I have a group of friends who locally get together occasionally to “play.” We have created some real “messes” in order to learn new techniques! We usually go to the annual Stampfest together in Clearwater, Florida, and another one in Orlando, Florida. In this area of Florida, there is an annual Treasure Hunt in the spring. For two weeks, we go to 10-14 different shops in a 50-mile radius to see what supplies/classes/suggestions each shop has. We get a make it/take it tag at each store, purchase a minimum of $5 in merchandise, and then get a signature from a shop owner or employee. At the end of the hunt, if we have signatures from all of the participating shops, we turn in the sheets to have them entered into a drawing. There is a grand prize where all shops have contributed plus a prize from the originating shop where we had originally signed up to participate in Treasure Hunt. I LOVE to read! Mysteries! I probably read 6 to 12 books every other week. Of course, I follow all of the CSI, Criminal Minds, Psych, Bones, etc. TV series as well. I also still do quite a bit of cross stitching; right now, I am doing a series of Dolly Mama patterns to be made into a quilt. Anything and everything around me. Swaps and mingles from OSA – first and foremost plus all of the inspiration from participants in these group activities. 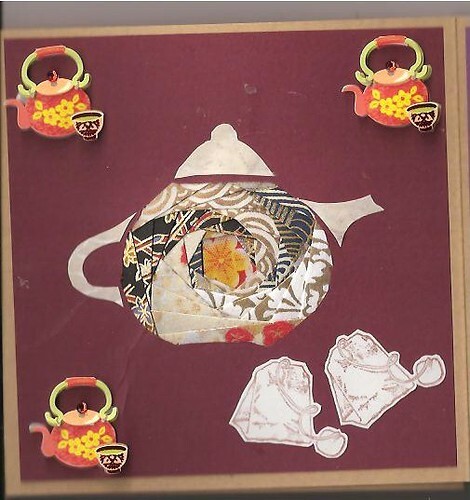 In order to participate in this groups swaps, I have had to learn new techniques (for example, tangrams) and new themes that I would not have done on my own. Friends, blogs, especially all of the online sites that have card layout examples and challenges; Technique Junkies newsletters; VSN suggestions. Traveling aids in creating inspiration. Having lived a year in Okinawa has been an added bonus for my love of anything oriental. Only four hours of mandatory Introduction to Art courses required in college. One of these days, when I have time (maybe I should TAKE time), I would like to take some classes – photography, drawing, etc. I have used rubberbands, toothpicks, skewers, makeup sponges, Q-tips, Saranwrap, waxed paper, cleaned out stacked potato chip cans – and the list goes on. Who can function in a card-making environment without these! Thank goodness for retirement! I taught in high school, junior college, vocational-technical school for 20 years. In addition, I have had a wide variety of other jobs during my lifetime – mental health secretary, oilfield wellhead inventory control, graphic arts order entry to mention just a few. Some day I should maybe write a book about my life experiences. Originally from Illinois, I have lived in New York, Okinawa, Louisiana, Minnesota, and now Florida. I have five children (live with my oldest daughter Susan, who is a quality-control leader at a pharmaceutical company; two blocks away from my youngest daughter Beverly, who is an MDS coordinator at a local health care facility; Sharon, Bob, and Sandra – who all still live in Illinois). I have seven grandchildren and seven great grandchildren. My mom just passed away last year, so our family has longevity in our genes. I still like going “home” for Christmas to see the ice and snow but know I don’t have to deal with it on a 24/7 daily basis. I have chosen for my project an accordion 5”x5” 6-panel display of techniques other than stamping. The basic form is from Marco Papers. 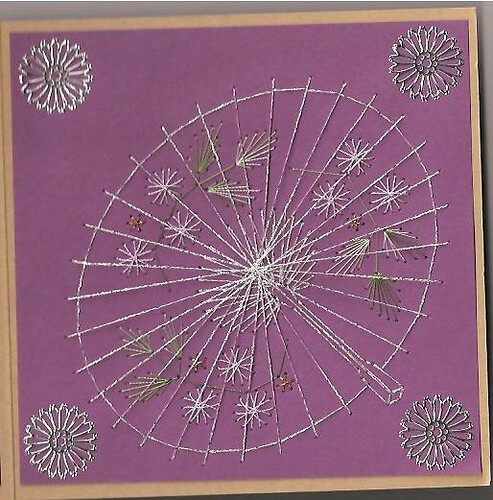 I also used a Tim Holtz Tonic paper piercer for the paper embroidery panels. Congratulations Barb ! So nice to read your bio and I love the accordion book ! Congratulations from the Netherlands toooo Barb. 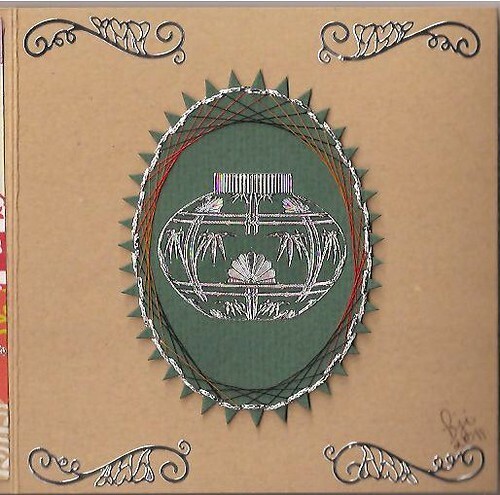 You have made a wonderful accordion book, like the way you have used all different ideas on it. Enjoyed reading about you and your project is fabulous…so many new techniques to try! The paper stitching is gorgeous! It was so interesting to read your bio – how on earth do you manage to fit all these things in?! The annual treasure hunt sounds great fun! Congratulations, Barb. This is an amazing project, and you are an amazing woman! So much talent. Enjoy your spotlight month – you deserve it! 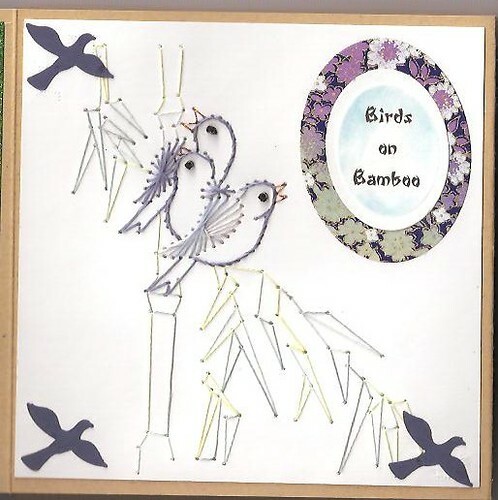 Congratulations Barb. . .your accordion book is wonderful. . .such a treat to read your profile and learn more about an amazing lady!! Enjoy your month in the spotlight!! Barb, You are the true Wonder Woman !! Love your project and Bio……….keep up the good work! Wonderful project Barb. And your bio was exhausting, all those groups, whew. Many congratulations on becoming this months SAM Barb! I really enjoyed your bio and your book is wonderful! 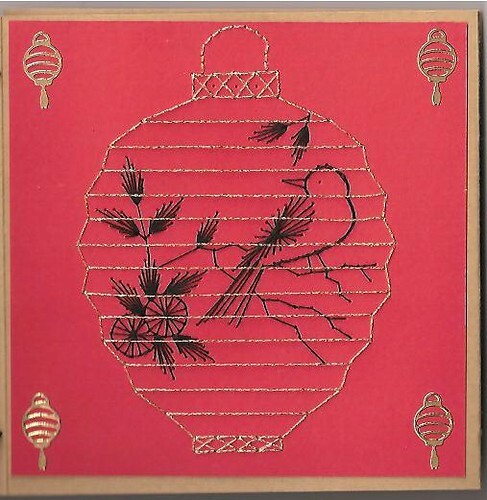 I simply love the stitched cards, my hubby sometimes makes these… I just can’t get my head around stitching! Great all round project…very inspirational! Well done! Ah Soooooooooo…sigh! Wonderful bio – enjoyed your journey. Your card(s) are delicious to see and almost feel the texture…I’ve been wanting to try the stitching and already love the iris folding. Thanks for the inspiration Barb! Congratulations on being the November SAM. I like all the different styles in your book. Iris Folding is one of my favorite card techniques and all the stitching inspires me. Congratulations for being SAM this month. Your accordian display book is a masterpiecen & fantastic!! receives it should treasure it. WHAT AN INSPIRATION with these beautiful cards, Barb. CONGRATULATIONS for being featured as our November SAM. Congratulations Barb! 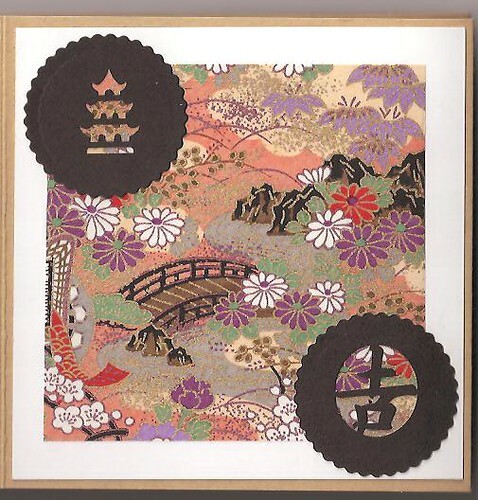 What a wonderful accordion book and so very creative and inspirational. Enjoy your month as SAM! beautiful book. I wish I was that talented. enjoy your month. Just discovered your blog. You have so many different beautiful cards. Very creative. Woud love to have your talent. Hello Barb, I was on a blog and there was quite a list of folk on it and guess what? Here was your name and story. You had told me a little but I know more about you now and I enjoyed the short time I spent with you in Bundaberg,Queensland, Australia. Yes please write that story about your life. But where could you find time with such a busy life. Kind regards Betty K.